Our regular practice area is about an hour radius from Denver. This encompasses the Front Range from Colorado Springs to Loveland and Bailey east to Bennett. 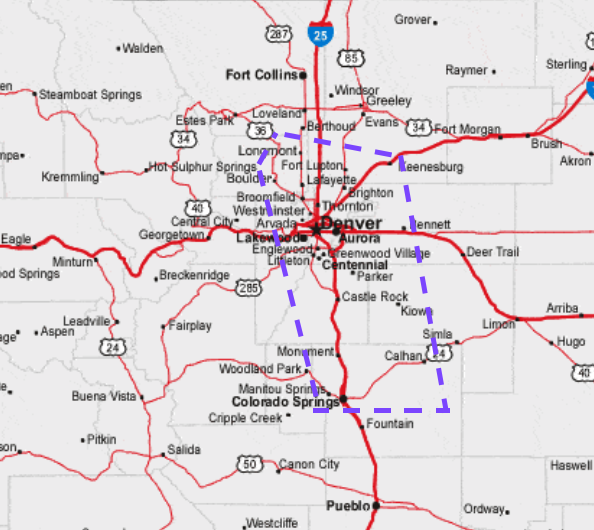 Towns include Denver and surrounding cities, Parker, Franktown, Elizabeth, Kiowa, Castle Rock, Sedalia, Larkspur, Monument, Colorado Springs, Black Forest, Calhan, Bennet, Brighton, Fort Lupton, Longmont, Niwot, Boulder, Golden, Conifer, Bailey, Silverthorne, and Dillon. We also travel to Fort Collins, Greeley, Strasburg, Fairplay, Woodland Park, Florissant, Guffey, Pueblo, and Vail if there are enough horses to justify the travel time. The blue dotted lines outline our regular practice area.